What seamstress haven’t thought that it’d be nice to have some helpful mice to assist with sewing? Everyone who also happens to be a Disney fan, I should guess. When I saw the soft toy mice ‘GOSIG’ (literally means ‘cuddly’) at IKEA a few years ago I knew I wanted to make one of Cinderella’s little friends. We got a handful of the mice, as I had another idea for them as well. Two has since been adopted by one of our children, but the rest has led a quiet life so far. Now, I’m planning a Disney themed party for my 35th birthday – “growing old is mandatory, but growing up is optional” as Walt Disney said – and I wanted one of Cinderelly’s mice as decor. I had to change the posture of the mouse, as the mice in Cinderella walk upright. I did this simply by putting a few stitches here and there to pull the chin down slightly, and the legs to an upright position. I wrapped some thread tightly round the midriff, as the female mice in Cinderella seem to follow the narrow waisted ideal of their human counterparts. I put a pipe cleaner in the tail to make it poseable and held the ears back, so they wouldn’t show under the headdress. Then it was on to the fun part; the outfit. I wanted the outfit to be easily recognisable for anyone who’ve seen the film, so I didn’t have to think about the style. All the female mice wears a tight-fitting bodice worn over a short sleeved dress or skirt/shift combo, much like Cinderella’s. Under the skirt they wear ankle length drawers. With this they have a pointy cap with a turned-back brim, and an apron tied at the waist. I used only material from my scrap bin, as I didn’t want to cut into larger lengths of fabric for a project like this. Most of the fabrics are re-purposed from old clothes and such, and show signs of wear, but for this, that was a bonus. I doubt the mice’s clothes were made from new material in the film. I chose fabrics in my favourite colour blue, trying to pick ones that went well together, and with patterns and textures were more interesting than the flat solids of the film. I’m sure the solid colours are mostly a result of too detailed patterning on clothes being a huge time waster in hand animation anyway. 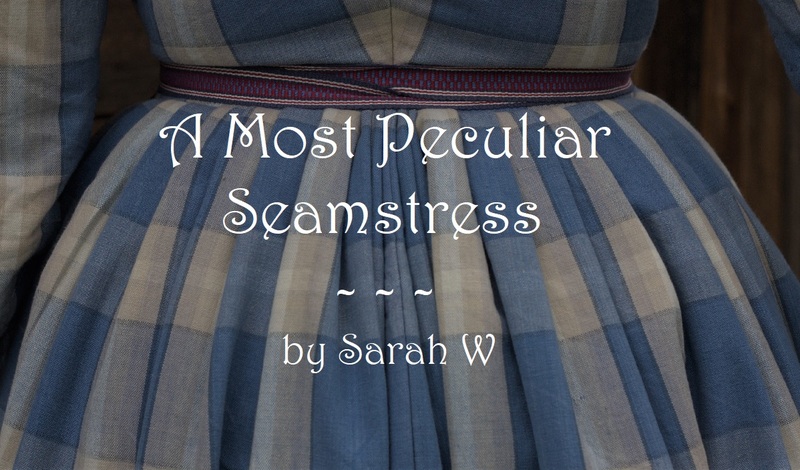 The checked skirt is the only part that is obviously patterned, but the bodice is made from a herringbone twill, and the apron from an ordinary twill. Sleeves, cap and drawers are all made from the same plain old sheeting. I had no pattern but went with a combination of eye-balling and draping. I don’t think I even measured once. Not a perfect method, but I’m quite pleased with how it came out in the end. The cap is lightly stuffed with thread ends left over from the sewing – no waste, plus I didn’t fancy getting up to get batting. For the sleeves and drawers, I took advantage of nice selvedges to avoid clumsy hems. I also used a selvedge to prevent bulkiness when pleating the apron. The drawers have an opening for the tail. A petticoat would have looked cute but is not present in any of the mice’s wardrobes as far as I can tell. Many of the female mice has a bow tied in their tails, but I haven’t decided if I want to do that, or if it’ll be too fussy. I opted out of the bow at the front of the bodice some of the mice has for this reason. The outfit is hand stitched, as that gives a neater result in things this small, and it made it possible for me to stitch while having the sleeping baby in my lap. Of course, I also really like hand sewing. So now I have a little sewing mascot, for of course she will not only be used as a party decoration. I must find a name for her too, a mascot needs a name. At the moment she sits at the top of our bedroom mirror, that also serves as my fitting mirror when sewing, but she has yet to find a more permanent home. How do you like her? Oh I love your little sewing helper ❤ And how wonderful that you've added a navigation to your blog, now it's so much easier to peruse it! How sweet! I always loved the mice in Cinderella. Yours looks really very much like them, only more real with the patterned deails. The perfect sewing mascot! And I really like your new blog, too! Thank you! I always try to make things look real and believable, even if it’s fairytales. Glad you like the new blog, too! She is so adorable! Now I might have found the perfect little gift for my friend who is a Disney fanatic… Thank you for the inspiration!